Proud performers: From left, Tidar Sumarsono, Trainer, Fery Ainul Wahib, Mechanic, and Aji Purwanto, Atlas CopcoTechnician, with the PowerROC T50. Among the thousands of islands that make up Indonesia’s tropical archipelago, few tourists find their way to the outlying Wetar Island in the remote parts of Maluku Province. Surrounded by coral reefs and characterized by mountainous peaks, Wetar Island is home to just 9 000 inhabitants and the only way of reaching it is by boat or landing craft from a handful of mainland ports. Here, on the north-central coast of the island, mining contractor and equipment rental company PT Madhani Talatah Nusantara has been tasked with developing the resource at the Wetar Copper Project – a copper ine which has a projected 10- year lifespan and a high copper grade of 2.4% Cu. The Wetar Copper Project is owned by PT Batutua Tembaga Raya, a subsidiary of Finders Resources Limited. In its endeavor to reach new sections of the mine’s orebody, a powerful drilling solution capable of handling complex ground conditions was required. The mine’s tough geographical structure involves sandy and abrasive rock with a density of up to 4.2 tonnes/m 3 . This posed a considerable challenge for the drillers on site, but service reliability of the equipment was also crucial and finding the right tophammer drilling solution with powerful air flushing to extract the cuttings was a priority. Due to the sandy rock conditions, the bench height was set at 6 m with a drilling burden of 3.5 m and a hole diameter of 102 mm. To tackle this challenge, two PowerROC T50 drill rigs equipped with COP 3060 rock drills and T-Wiz 60 drill rods were put to work. According to Nick Holthouse, Earthworks Manager at PT Batutua Tembaga Raya, the results from running the drill rigs for 11-hour, 7-day shifts were more than satisfactory, especially in the mine’s grade control program. “The rigs have performed well in the highly abrasive and dense ore types. The ability of these rigs to cleanly highly abrasive and dense ore types. The ability of these rigs to cleanly lift the heavy cuttings produced while drilling is paramount in achieving a good quality sample, which is essential to the operation’s grade control program.” Using the PowerROC T50, 17.5 m were drilled per hour and rig with an average fuel consumption of 21.7 liters per hour, which enabled high productivity and efficiency. 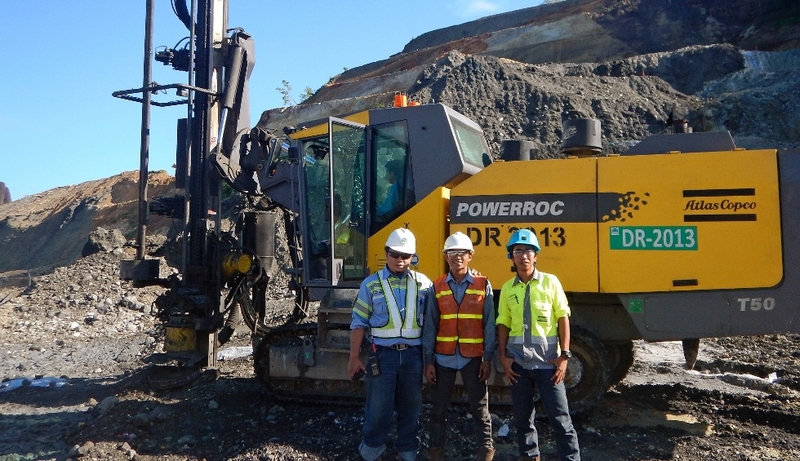 Taufik Pribadi, Project Manager, PT Madhani, says: “During startup, an Atlas Copco service engineer provided us with training on regular troubleshooting, guided us on how to view the hydraulics and electric diagram and explained the structures and functions of the PowerROC T50. The drill rigs achieved a net penetration rate of up to 3 m/min. Hole cleanliness was guaranteed thanks to the high flushing air speed, which resulted in straight holes with no deviation and a minimized risk of bit jamming. Having operated the PowerROC T50 during startup, Drilling Trainer Tidar Sumarsomo emphasizes the importance of clarity and simplicity when it comes to rig controls. “The PowerROC T50 is easy to operate. I can start drilling easily after a short instruction and the drilling is is really fast.” he says. “Most of all, I don’t need to worry about complicated structures that I don’t understand. All mechanical and electrical connections are marked and labelled clearly.